Trail Mixers gather on the beach at the Western Lake outfall at Grayton Beach State Park. Not satisfied to simply photograph stand up paddleboard (SUP) surfers, Carlton Ward piles into the chop, wetsuit-less but resolute. 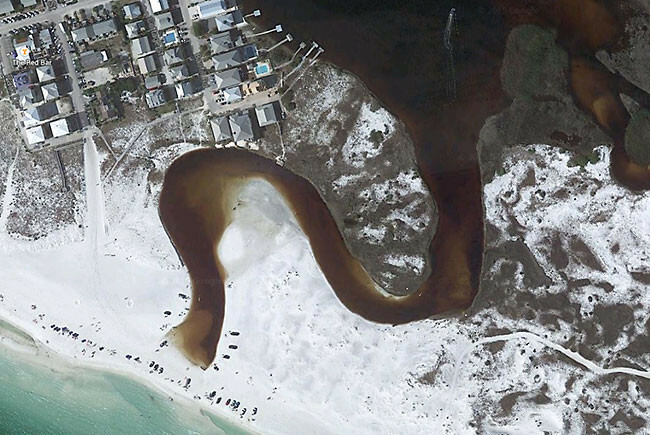 An aerial showing where Western Lake, the second largest coastal dune lake in the Florida Panhandle, sometimes meets the Gulf. 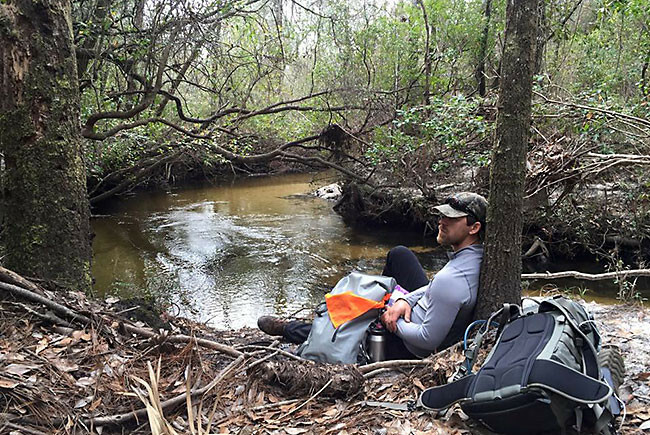 Joe Guthrie traverses Topsail Hill Preserve State Park. 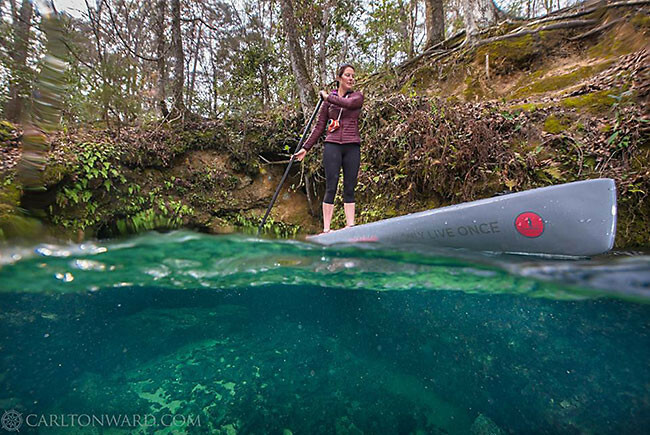 Mallory Dimmitt explores Gainer Springs Group, a collection of springs which supply 1,400 million gallons of freshwater each day to Econfina Creek. 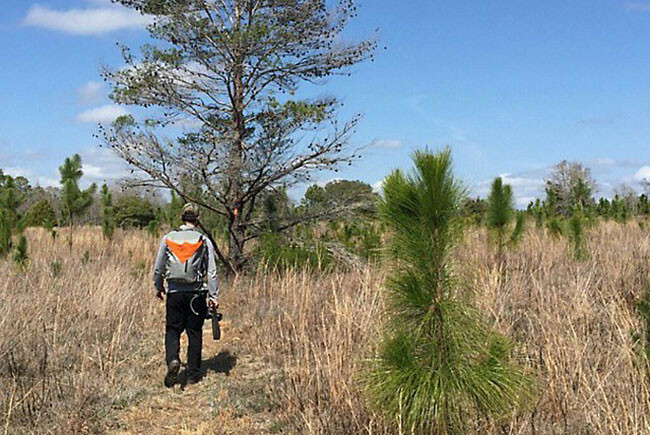 After following Lafayette Creek and its tributaries for several miles, the Florida Trail emerges on Nokuse Plantation where longleaf pine restoration is underway. 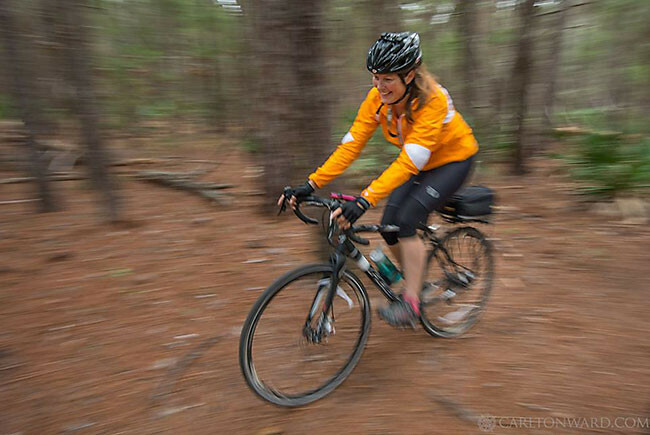 Day 51: Mallory Dimmitt races through pines in Point Washington State Forest. Hiking the Florida Trail along Magnolia Creek in the Lafayette Creek WMA. 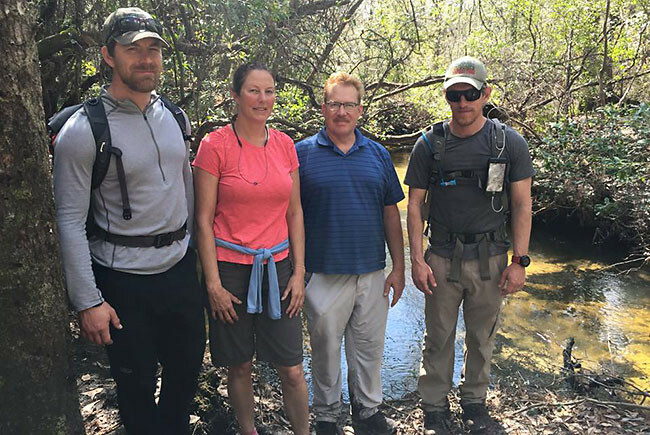 L to R: Team members Joe Guthrie and Mallory Dimmitt, David Clayton of Northwest Florida Water Management District, and Carlton Ward Jr. 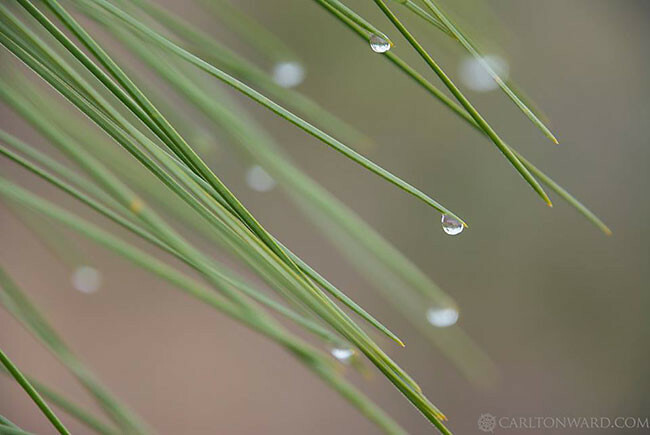 Morning dew drips from a young longleaf pine growing on the Nokuse Plantation, the site of the largest private longleaf pine restoration in the world. Joe Guthrie rests at Magnolia Creek in the Lafayette Creek WMA. The Expedition entered Eglin Air Force Base, Florida for a few days of backpacking. 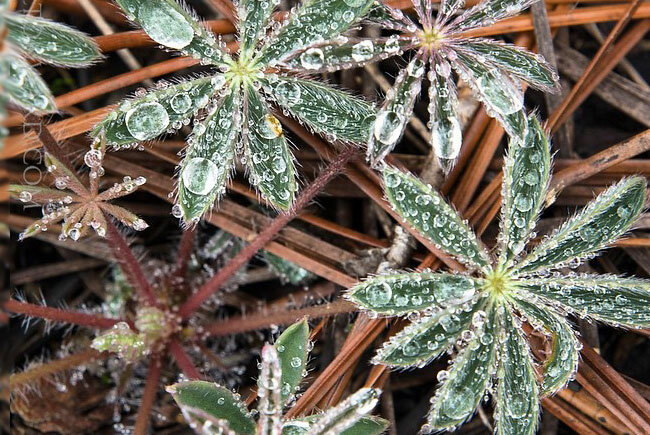 It rained rained, making the woods even more beautiful. What happens is that when it rains a lot, the water breaks through the sand dunes and flows into the Gulf, letting all that salt water flow back in. This totally changes the marine ecology of the lake for days at a time, until the sand silts up again, and becomes black water again in the lake. The Expedition entered Eglin Air Force Base, Florida yesterday for a few days of backpacking. It rained of course, making the woods even more beautiful. 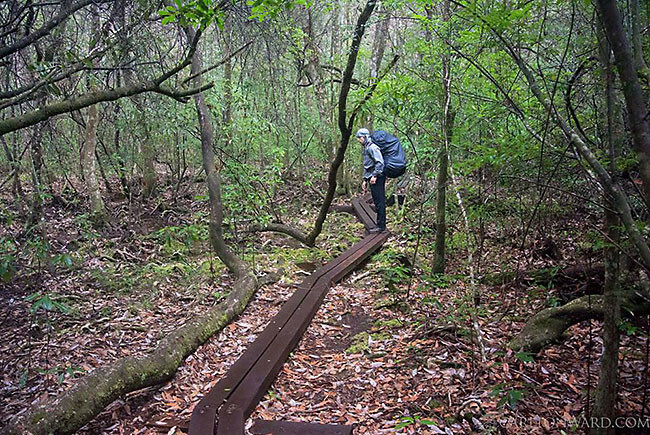 Thanks to the Florida Trail Association for building boardwalks through the swamps! Several milestones reached today: we had our longest day yet of backpacking (17.6 miles) and we passed the highest point on the Florida Trail (<300'). The Expedition comes to an end in 2 short weeks!! Mallory Dimmitt races through pines in Point Washington State Forest. 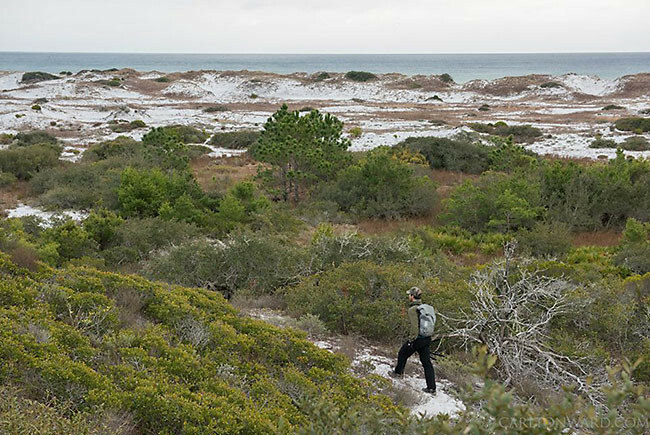 Positioned between Eden Garden, Grayton Beach and Topsail Hill State Parks, the Point Washington State Forest helps connect a conservation corridor beside the beaches between Panama City and Destin. The Expedition route today connected these coastal conservation lands to the larger Florida Wildlife Corridor north of Choctawhatchee Bay. You have a lot of time to think when you’re paddling thirty miles in one day, and I passed some of it by pondering all of the many factors that contribute to the species richness of this region. The Apalachicola basin is one of the nation’s six biodiversity hotspots, it’s fertile floodplains and waters supporting supporting hundreds of species of plants, birds, mammals, and more reptile and amphibian species than anywhere else in the U.S. and Canada. Most of these animals are hidden from view in the cold weather, but I have visited the point of origin of this river system in the heat and humidity that cloaks the green ridges of the north Georgia mountains in late August. I conjured up images of the spring at the top of the watershed, just a few hundred feet down the from Appalachian Trail at Chattahoochee Gap. I imagined the water’s journey as it erodes the southern end of the ancient mountains and carries their life sustaining sediments to flood these forests, where it then picks up and transport additional nutrients to ultimately feed the Bay and the Gulf beyond. You're invited: Come and meet the team at this upcoming Trail Mixer. Make your reservation ASAP - spots are limited! 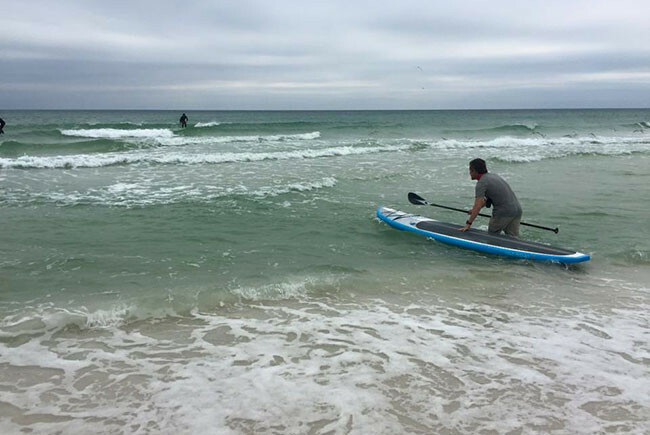 Join the Florida Wildlife Corridor Expedition team and members from the Florida Park Service for a 3-mile paddle! 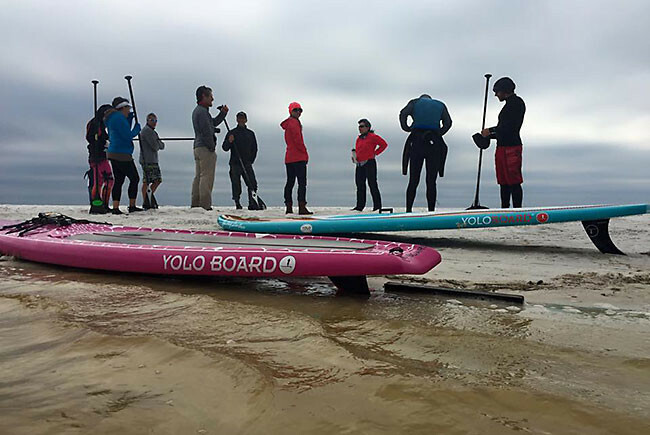 12:30 p.m.: Introduction to Carlton Ward Jr.
Space is limited to 50 guests for the river paddle, but 150 guests can be accommodated for the reception. If you'd like to particapte in the paddle, please RSVP here: www.eventbrite.com/e/trail-mixer-9-blackwater-river-paddle-tickets-15179339814 AND by contacting the Blackwater Canoe Rental at 850-623-0235. Click here to visit their website: www.blackwatercanoe.com **In order to participate, you acknowledge that you're acting as your own that private trip and are responsible for your own safety and welfare.